Find My AirPods is now a real feature. 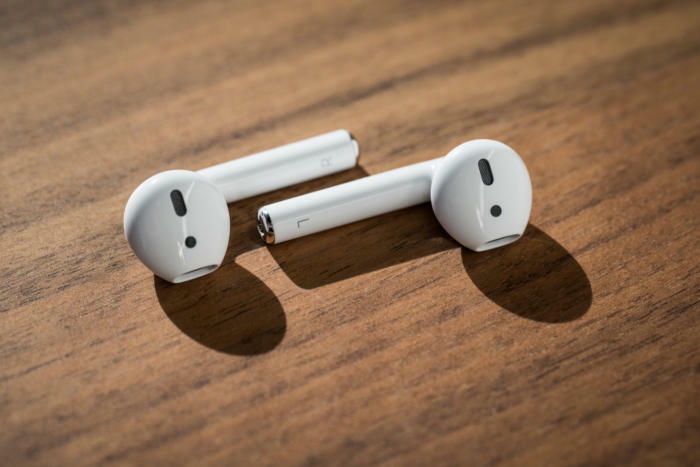 Losing an AirPod is a legitimate possibility, and possibly the biggest worry that people have about using Apple’s new Bluetooth wireless earphones. Apple is no longer pretending this isn’t a real concern with a brand-new Find My AirPods feature in the Find My iPhone app. How it works: Bluetooth. According to Mashable, your lost AirPod doesn’t have to be close by for you to find it, but it does have to be in Bluetooth range of another one of your Apple devices connected to your iCloud account. If you know the general area your missing AirPods is in—say, your living room—but have no idea what crevice it’s trapped in, you can tap “Play Sound” in the Find My iPhone app. Your AirPods will start to chirp. Yes, both of them. If one is in your ear, the app gives you controls to mute the right or left earbud. If someone has borrowed your AirPods and that’s why they’re missing, the sound won’t pierce their ear drums, but the volume will gradually increase, so they’ll have to surrender the AirPods. What if your AirPods are dead? And the case, too? Find My AirPods will be able to pinpoint the last location it could detect a Bluetooth signal from the device. The feature is rolling out now to beta testers of iOS 10.3. If you’re not a beta tester, you’ll get access to Find My AirPods when Apple officially releases iOS 10.3.